The ball itself was about 3 1/2-inches in diameter and was manufactured with slightly flattend areas on them so that they could sit on a table without rolling. In fact, they were originally promoted as a paperweight or a conversation piece. There have been many imitators, especially since the '70s. 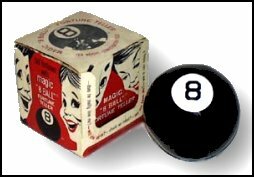 Avon made a lotion-filled 8-Ball. There have also been Magic 8-Ball styled key-chains, Yodas and Smiley Faces. Alabe continued rolling out the original 8-Balls well into the '70s.